Challenge #48 in the I'm Only Human, Of Flesh and Blood I'm Made... series. Hosted by ConanFuji, ConanFujiX. Basically that. If it's not to theme, don't submit it. Otherwise I MIGHT DQ it. Main Subject must fill a reasonably large percentage of the photo ( ~ 15% to 100%) Silhoutte type of shots discouraged and might be DQ-ed. Reasonably well composed shots only please. Main subject must be 1 Adult, there can be other adults in the back/foreground but they must not be the main subject. 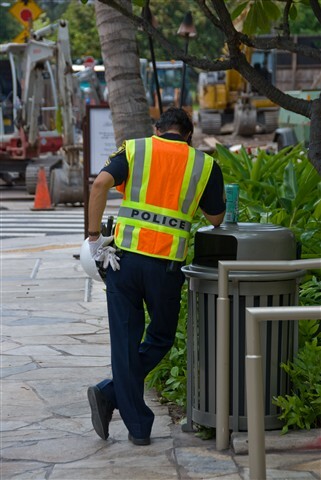 It aint easy working in Honolulu as a police officer, the sun, the surf, all year round good weather. Regular breaks required.